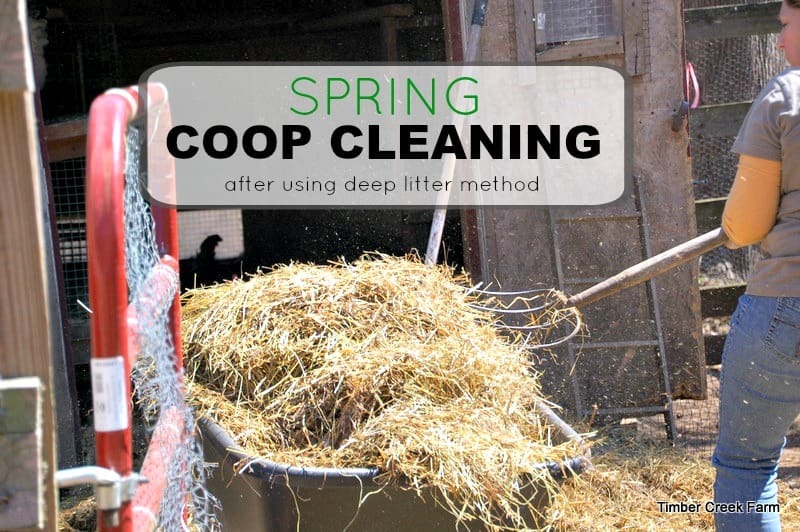 Spring coop cleaning day is a big day when we have used the deep litter method of coop maintenance. This deep litter needs to be completely cleaned out as the temperatures begin to warm. It’s a big job. The deep litter has been accumulating for months. It’s time for a complete cleaning. Since we have 25 hens and roosters living in the 12 x 8 shed, you would think that the smell would be pretty bad after a winter of no cleaning. But, surprisingly, it is not. 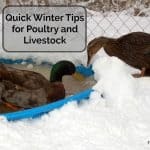 I use the deep litter method for chicken bedding during the winter months, and unless there is some water spilled, or moisture accumulating somewhere in the coop, there really is no bad odor. I do clean out the nest boxes more often throughout the winter. 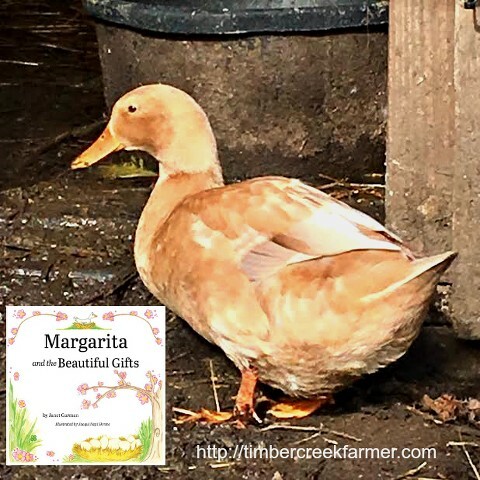 How Does Deep Litter Work in the Chicken Coop? Basically, the way it works is, you add clean pine shavings and straw, in the fall, in preparation for the winter months. You can read more about this method here. 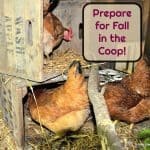 Once the weather starts to stay warmer, it is time to throw open the doors to the coop and begin scraping out the winter’s bedding. 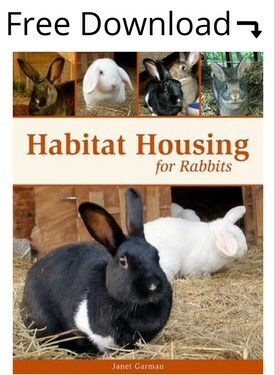 We do it by raking and scraping out all of the litter, straw, hay and any removable nest boxes etc. Now it is time to begin the cleaning. 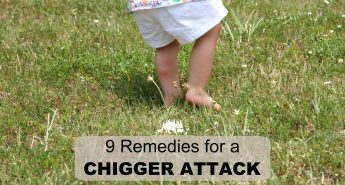 First I carefully look in the corners, under nesting areas and around the doors for any signs of chewing from outside rodents. It’s important to stop any rodent infestations as soon as you see any signs. Second, sprinkle Diatomaceous Earth powder around the nesting areas. 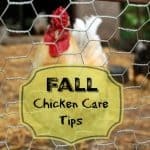 If you discover any moist or wet areas of the coop, let this area dry out before adding the new bedding. As you can see in this picture, there were some wet spots under the bedding. This was a recent spill from a bucket while trying to refill the water bowl. On top of the Bantam chicken partitions, we use chicken wire and old feed bags. The old soiled feed bags are removed and new ones are laid down. The feed bags are covered with hay or straw. 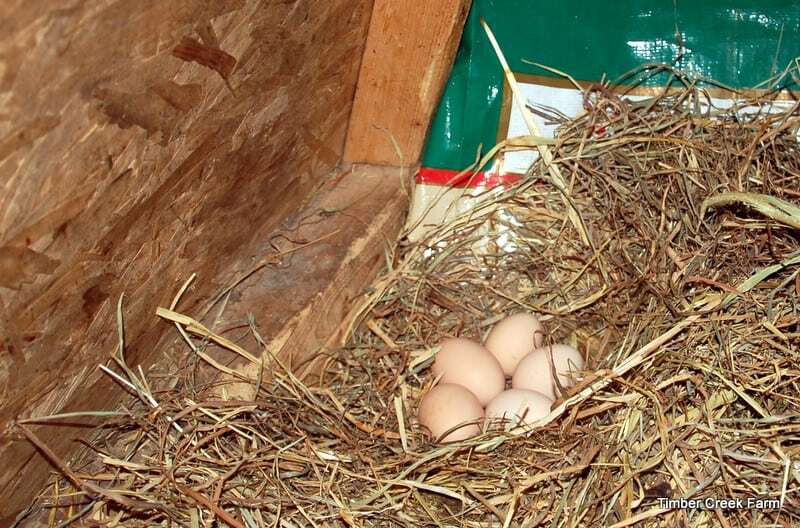 As you can see, this is one of the popular nesting sites in our coop. 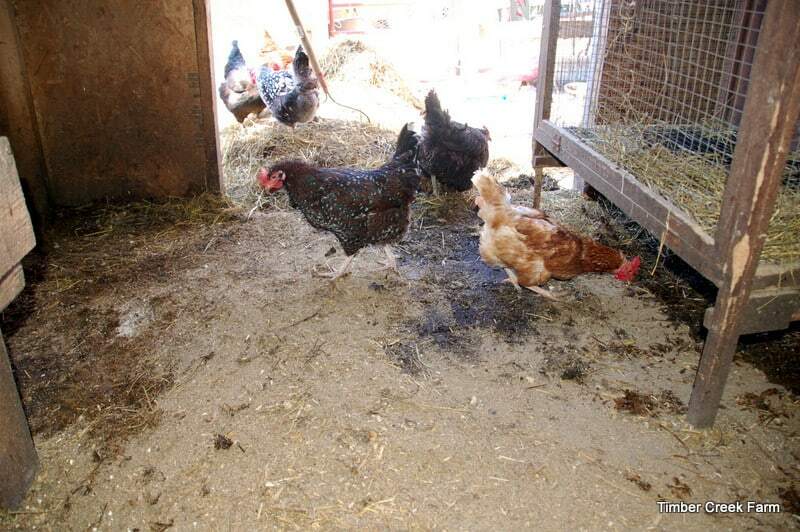 The next step in our coop cleaning is to replace the shavings or sawdust in the coop. I like to add some fresh hay or straw to any nesting areas. 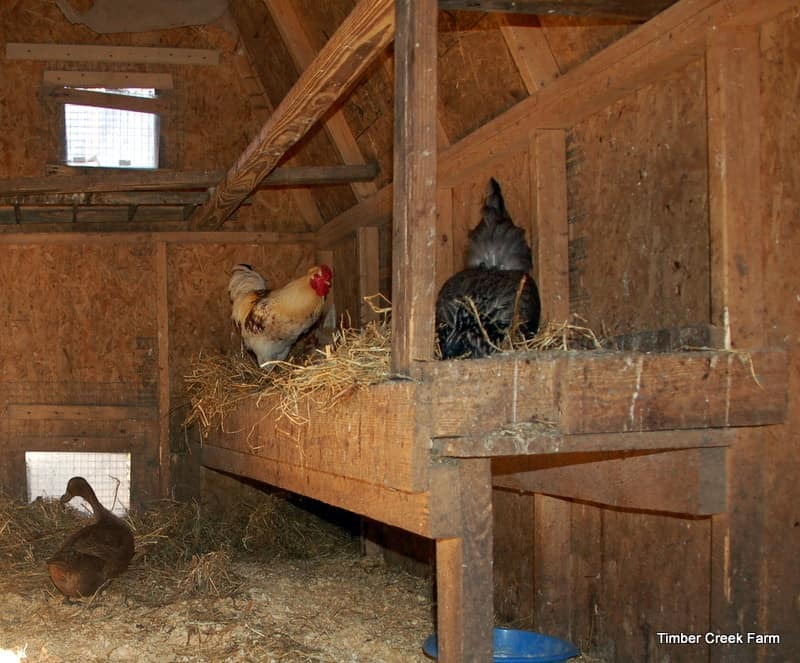 We have a few nesting areas in our coop. All of the chickens love coop cleaning day. They happily hunt through the pile of used bedding for any insects, bits of food or other treasures. We add fresh pine shavings and straw. Then the inspection crew moves in to give their stamp of approval. Meanwhile, across the way, the duck house has been stripped of it’s very wet bedding. 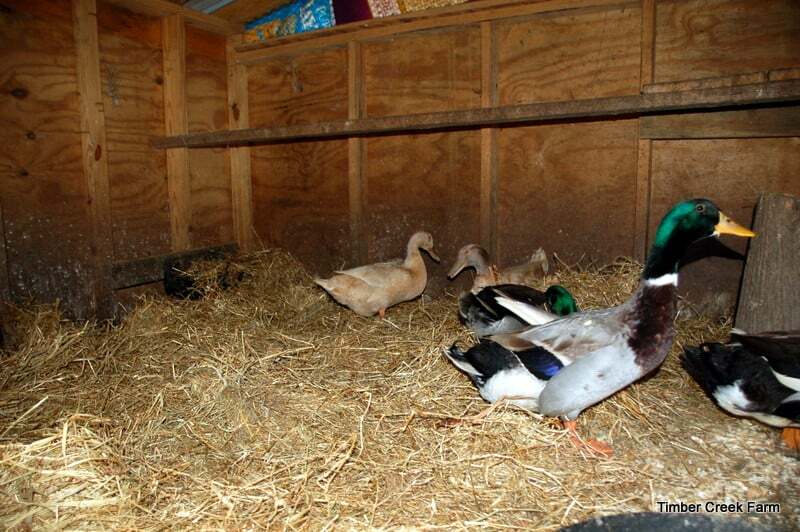 The duck house does get cleaned over the winter, unlike the chicken coop. 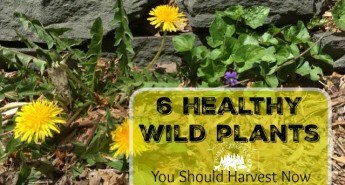 Each week, all of the wet soggy hay or stray and bedding is replaced with dry. 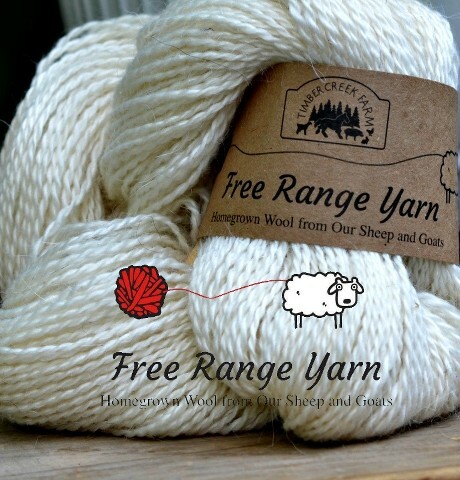 We try to do this on a dry breezy day, so that the house has time to dry out during the day. 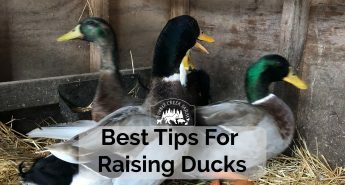 Keeping the duck house dry during the winter requires more frequent coop cleaning. During the summer months the bedding will be changed out more often. 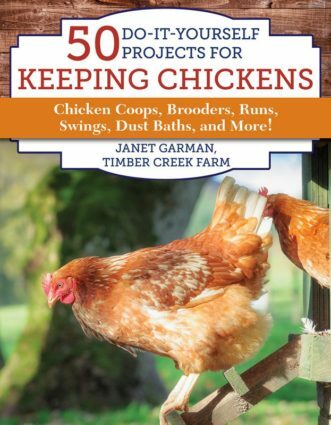 The chickens will not need the extra warmth of the decomposing bedding during the summer. All of the material scraped from the buildings during coop cleaning can be added to the compost pile. After carefully tending the compost for about a year, the waste pile will be a rich compost suitable for adding to the gardens. 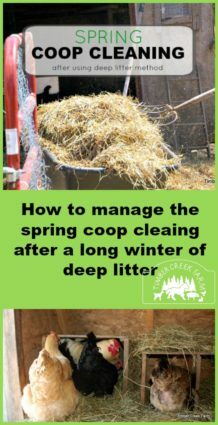 Therefore, as you clean out the coops regularly, keep a system going so that you know which part of the pile is the older compost. 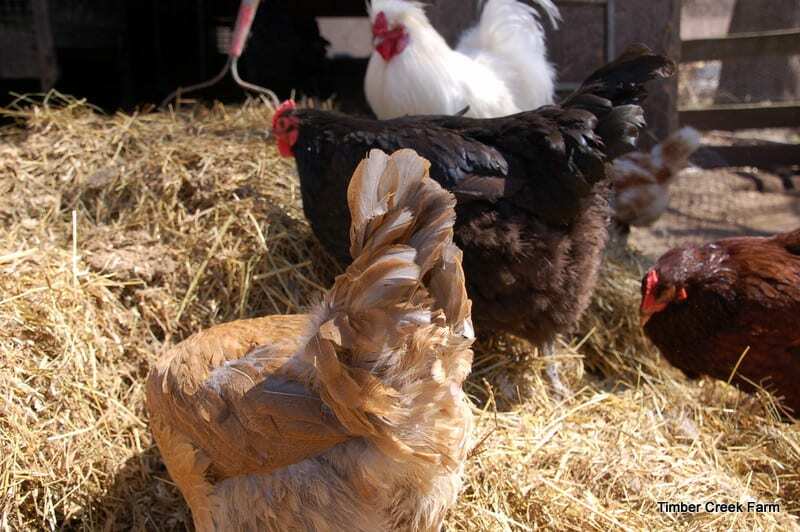 Read more on turning coop waste into compost in this post. Even though this may look like it takes a long time to accomplish, we really only spent a couple of hours on the coop cleaning. 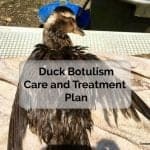 I hope this will give you an idea of how to keep your chicken and duck homes odor free and comfortable for your feathered friends. For more information on coop cleaning read this post on keeping your coop smelling fresh. 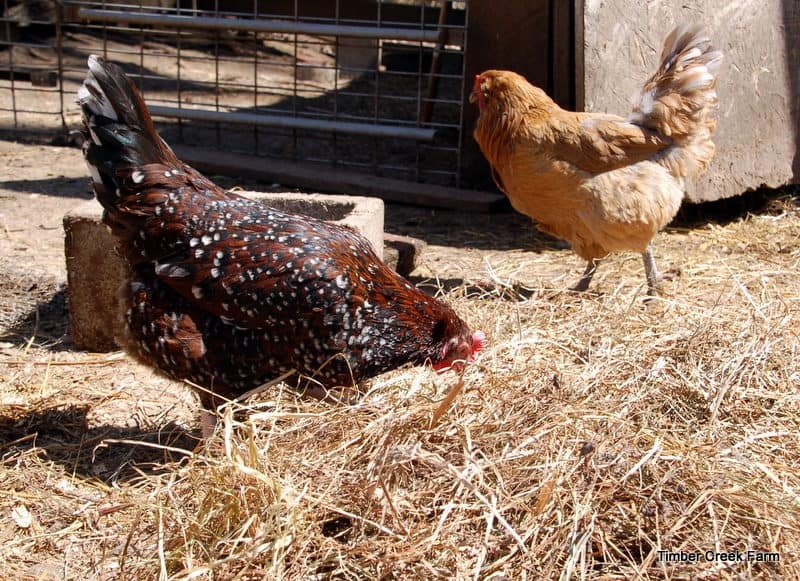 Interested in making compost from the chicken waste? Here’s how. I understand! It’s like after Christmas when I can’t wait to get the house decluttered from decorations and have some space. 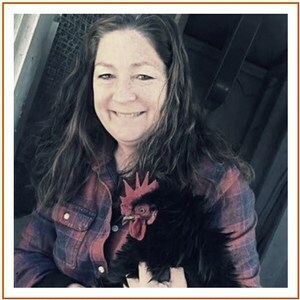 I love looking into a clean chicken coop! 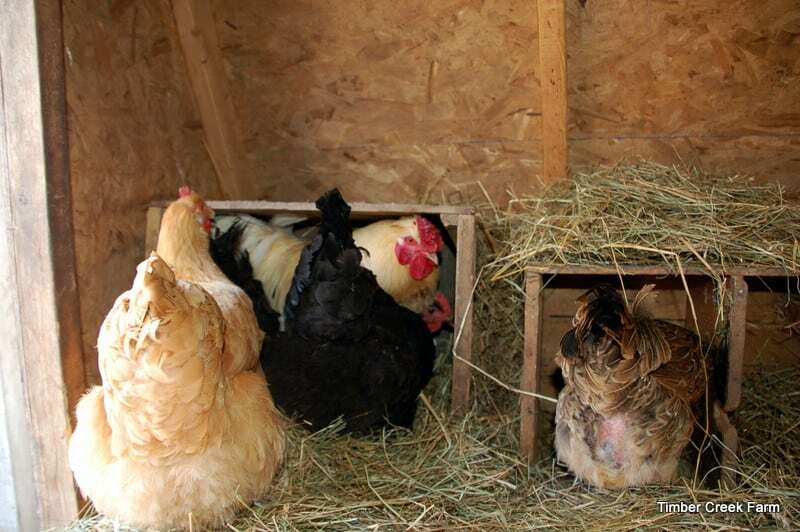 I cant wait for a somewhat warmish day to clean out our coop. 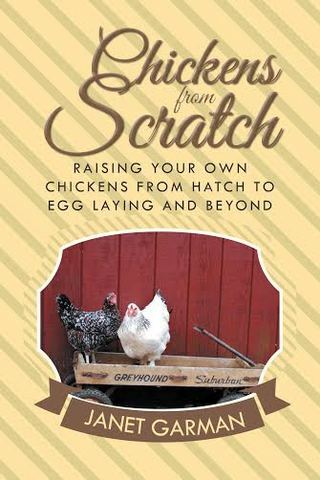 We only have 10 hens, but I am looking forward to trying some of your tips. Hi Lori. I hope you get good weather very soon! 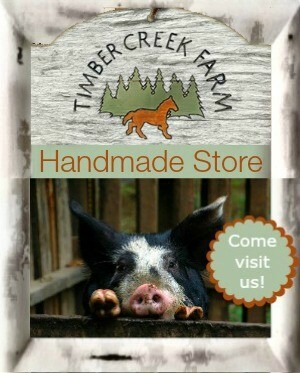 It’s funny because I don’t mind cleaning up the coops but I don’t keep my own house very clean! 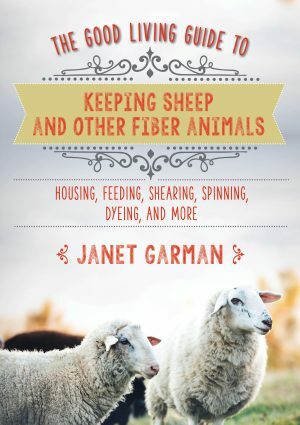 Hey Janet…….i KNOW that i read a blog post on rodent control (although total annihilation is more what i’m looking for), but i’m having a hard time finding it. I have a rat problem in my coop, we have been using traps, but they multiply so quickly that we are having a hard time keeping up. 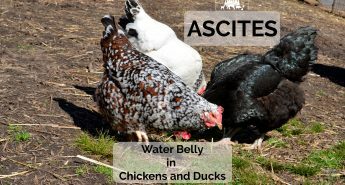 I’m worried about disease, I’m worried about them harming my hens, I’m tired of feeding and watering them, and I’m tired of their destruction of my coop. I do have four dogs – who have all become relatively good ratters, but they can’t keep up either. 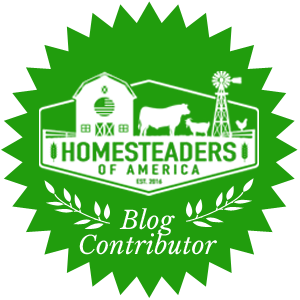 Is there such a thing that is only “detrimental” to the rodents and not to my hens, my dogs, or my husband and I?? Oh my Tammy, do I feel your pain. Our rat problem got so bad that they were everywhere and not afraid of us at all. 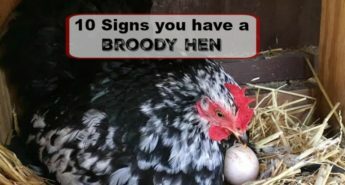 they even killed a couple of our hens. We did start using the Ramik poison blocks. The only problem with that is keeping the poison and the dead rats away from any domestic pets. basically, we had no problem and none of our pets got sick from us using the poison. I hated going that route but the rats were winning big time. We also tried putting a running garden hose down their holes and flushing them out or drown. It was marginally successful but they came right back. We had to not leave a speck of food in the coop at night. No food left out in the yard either. I wish I had better news for you. 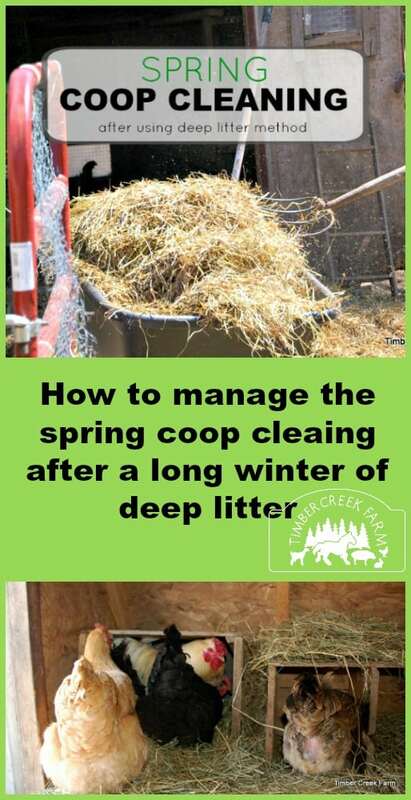 The deep litter method looks interesting, I can’t wait to try it out as soon as the dry whether is here! I am working on starting a deep litter method, but right now the ammonia smell is really strong. I turn the straw with a pitch fork every day. I am planning to add dry leaves. Is this a good idea? I thought I had good ventilation with having 2 windows currently left wide open. Not sure what to do! Any advice would be appreciated. (I have a 12 x 8 indoor coop for 10 hens and a huge outdoor pen where they seem to spend all day. 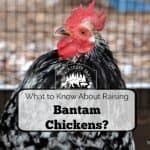 I did recently add 12 – 8 week young chickens. 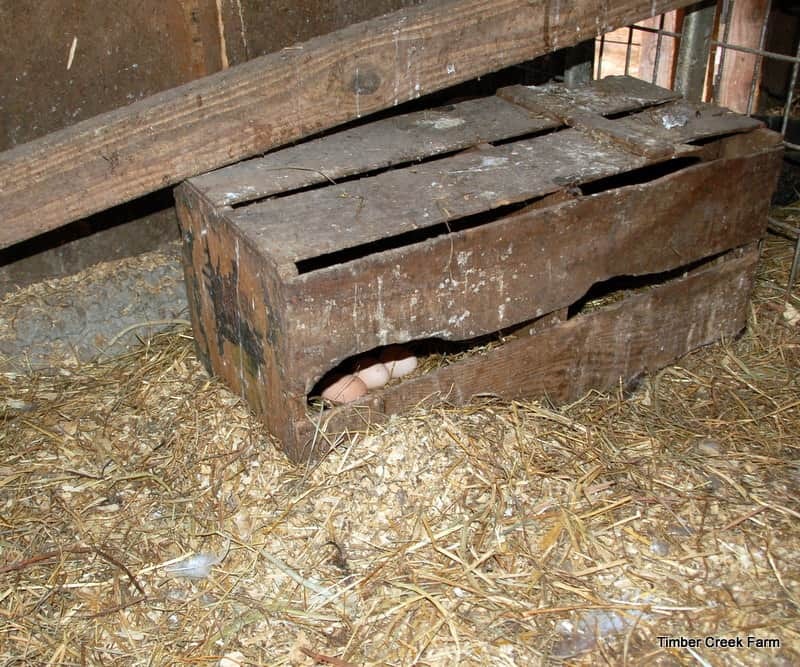 I don’t know if the smell was bad before or after as we recently are getting spring temperatures and this is the first year chickens have been in his coop). This is an issue you will need to address immediately. the ammonia smell can be harmful to chickens respiratory tracts, especially in baby chicks. I came across this type of cleaning first time. 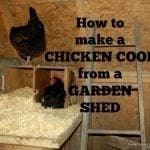 seems like its one of the best methods to clean the coop. should try it out once.